Last week, my family and I spent a few days in Nagasaki prefecture, mostly in and around the city of Sasebo. We had some grand sightseeing plans for every day of our break, but I have to admit we postponed one or two due to the crazy heat. It is STILL brutal over here with no end in sight. We did, however, manage to squeeze in a cruise of the Kujukushima in Sakai National Park just north of Sasebo city. 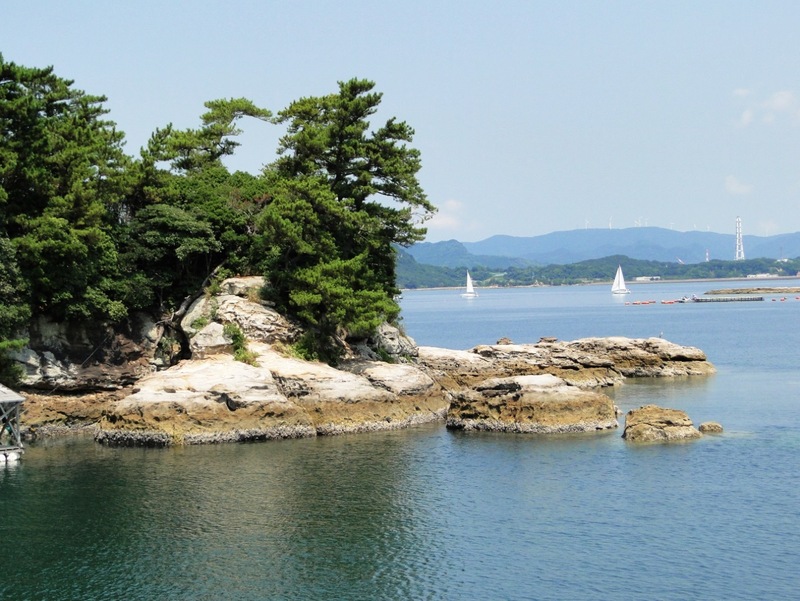 Kujukushima means “99 islands”, although there are more than two hundred little outcrops scattered throughout the bay. Some of the islets are heavily forested, some are little more than bare rocks and dirt, and a handful have small communities. If the islands look slightly familiar, it’s because they feature in the opening credits of the film The Last Samurai. Cruises of the islands leave from the pier at the Saikai Pearl Resort every hour from 10am to 3pm (except at noon). However, if you have kids in tow or are just channeling Jack Sparrow, you can reserve a place on the red pirate ship Kaiou that leaves thrice daily (11:30am, 1:30pm, 2:30pm). During summer holidays and Golden Week, games and a pirate-themed scavenger take place on board. On the regular sailings, there are taped English explanations of the scenery, though it’s often difficult to hear them above the noise of the ship and the chatter of the passengers. Pick up a very informative English leaflet from the ticket counter instead. If you speak Japanese, feel free to strike up a conversation with the volunteers on board – many of them have extensive knowledge of the Saikai National Park. You can find schedules and prices for ferry departures at the Saikai Pearl Resort website. Hmmm, I stayed in a Toyoko Inn in Nagasaki before and I’ve heard the Central Hotel in Sasebo is nice. I’m afraid that’s all the personal recommendation I can give for lodging over there!